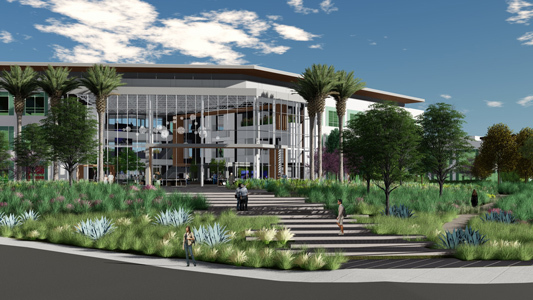 Communications company Viasat’s new California campus can accommodate six office buildings, three parking structures, a cafe/conference center, and employee amenities. Located across the street from Viasat’s existing headquarters, the new campus can accommodate six office buildings, three parking structures, a cafe/conference center, and recreational amenities for company. The new campus is designed to embody Viasat’s culture of creativity, exploration, freedom, and innovation, as well as foster interaction between employees, clients, and visitors. The two- and three-story office buildings provide 54,534 m2 (587,000 sf) of space. One of the buildings feature below-grade parking to provide visitors a secure entrance without compromising the open campus feel. Careful consideration was given not only to the internal campus elevations, but also to neighboring structures. Woven throughout the open, outdoor space are ‘unexpected experiences’ such as hammocks, swings, bocce ball courts, jogging trails, water-filling stations, several shade structures for informal meetings including some with banquette seating, trees surrounded with bar-height counters for outdoor eating, an outdoor stage, firepits, a barbeque, charging stations for mobile devices and other amenities, as well as displays of Viasat’s latest technologies. Project consultants include PLSA (civil engineer), Ground Level (landscape architect), Wiseman & Rohy (structural engineer), Syska Hennessy (mechanical/plumbing engineer), Michael Wall, (electrical engineer), Whiting Turner (general contractor), and Brummitt Energy Associates, serving as energy consultant.